Bihar Combined Entrance Competitive Examination (BCECE) is an annually conducted examination by BCECEB (Bihar Combined Entrance Competitive Examination Board) governed by the government of Bihar under the BCECE Act of 1995. BCECE is conducted to get admission in Engineering, Medical, Agriculture programmes in Universities of Bihar. It is conducted in 2 different stages. Stage – 1 is known as qualifying stage. After qualifying the 1st stage, candidates are applicable for another session or they are marked unsuccessful in the examination. Stage – 2 is the final examination; after which the candidate is called for interview and counselling if they qualify for the same. Stage – 1 is total 2 hours and 15 minutes duration whereas Stage – 2 is 90 minutes per subject. The examination is objective type and is published in two languages that are Hindi and English. The examination is done by pen and paper or offline method. Candidates need to mark on the OMR sheet their choice of answer. The questions are multiple choices only (four options per question) and there are total 4 subjects in the exam (Mathematics, Chemistry, Biology, and Physics). The candidates can opt for either PCM or PCB or CBA(chemistry, biology and agriculture science). For each correct answer, 4 marks are given. There is negative marking i.e., 1 mark is deducted from every incorrect answer. The syllabus of the examination will have parts of physics, chemistry, mathematics, and biology from the 12th class. NOTE- For Stage-2, the candidate has to appear for each exam separately. The candidate should have the domicile certificate of the state of Bihar. The minimum age limit for agriculture courses is 17 years, whereas there is no provision of age limit for engineering and pharmacy programmes. Candidates appearing for boards in the current year can also apply for BCECE examination. For Engineering candidates should qualify their 10+2 or any equivalent examination with minimum 40% with Physics and Mathematics as mandatory subjects. 5% relaxation is given to candidates of SC/ST category. For Medical/ Pharmacy courses candidates should qualify their 10+2 or any equivalent with Physics and Chemistry as mandatory subjects with minimum 45%. 5% relaxation is provided to candidates for SC/ST category. The application form for Stage-1 of the examination will be available by 1st week of February 2018. Last year the application window closed on 6thMarchh. The candidates have to apply for the application form online by first registering themselves from the official website with email or mobile number. After successful registration candidates are sent a unique password to their registered email or mobile number which is used to login for further process and then the candidate has to pay the application fees. The fee is INR 1000/- for General category candidates for PCM or PCB and INR 1100/- for PCMB. For candidates of SC/ST category the fees is, INR 500/- for PCM or PCB and INR 550/- for PCMB. The payment of fees can be done through Challan, Net banking or credit card/ debit card. After payment of fees for the online application, candidates have to fill or select their personal and educational information and upload candidates photograph and signature. 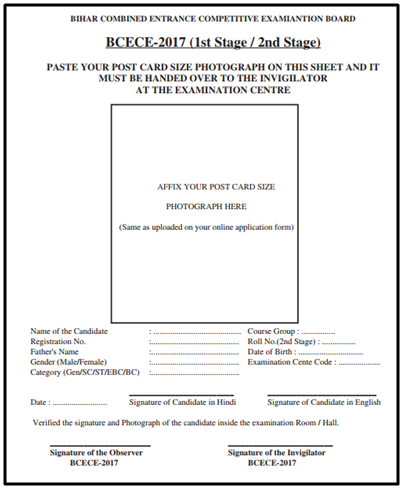 After the online process candidates should dispatch the downloaded hardcopy of the application form (Part-A and Part-B), paid challan with the required enclosure like Candidate photo, qualifying examination marksheet, character certificate, caste certificate (if applicable) and more through registered post or speed post. The candidates must keep in mind that while dispatching the form and other documents that the application should be in a yellow envelope of 17cm x 30cm. Each document should be sent in a separate envelope. The Admit for Stage – 1 and Stage – 2 will be available from the first week on March-April 2018(Tentative) . The admit card is to be downloaded from the official website. To access or download the candidate should enter their application number and password. Candidates are not allowed to make any changes once the admit card is downloaded and the information is filled. The result will be available by April 2018 for stage-1 and June 2018 for stage-2 by the conducting authority of the examination. The candidates can download their results or rank cards online from the official website of the examination by clicking on the ‘BCECE 2018 Result’ button and entering their examination roll number and password. After entering the account, candidates have to download the PDF displaying the merit list.On the basis of merit, the candidates are called for an interview; the details about the interview will be updated online. Seats are allotted to the candidates on the basis of their performance in the examination, preference and availability of seats. The counselling for different groups (PCM, PCB, and CBA) will be conducted separately on separate dates. Around 50% of seats are reserved for the general category and remaining 50% for another category as follows: 16% for SC, 1% for ST, 18%for OBC, 12% for BC and 3% for RCG. The candidates after the interview session and final selection have to pay the initial fees to confirm their seats. If any candidate is unable to pay the fees within the stipulated time period, it may result in loss of the allotted seat. The notification for the examination is expected to be released in the first week of February 2018. The official notification for BCECE 2018 can be downloaded by visiting the official website. Candidates must go through the following table carefully as it gives away information about the important dates related to BCECE 2018. Candidates are advised to thoroughly go through the FAQ section given on the official website of BCECE before contacting the admission directorate for clarification of any doubt. The final result of BCECE 2018 will be declared around the third week of June 2018. Candidates will be able to check their results and download their score card from the official website. After the exam is conducted, candidates are expected to regularly visit the official website for updates regarding declaration of results and counselling process that will follow soon after the declaration of results. The number of candidates appearing in the BCECEentrance exam all across the country. The number of applicants applying for BCECE. Following cut-off list comprises of cut-off for various categories in both the stages. The validity of the examination score stands for the particular academic year only. Hence, the validity of BCECE 2018 score will be for the academic year 2018-19 only. Every candidate will get only one chance to appear for BCECE for a particular academic year. Request for multiple attempts in any scenario will not be entertained by the admission directorate. Candidates will be able to view their scores once the result is hosted on the official website. This score will be the basis of their selection in BCECE. The scores can also be viewed by simply logging on to the the official website. After the successful conduction of BCECE, the results will be declared around the third week of June 2018. Those candidates who will be scoring above the cut off mark will be shortlisted for counselling according to the order of merit. Candidates can download the previous year papers of BCECE and also the sample papers related to the same online. They are advised to attempt these papers before taking the actual test. This will help them to get accustomed to the level of the questions asked in the examination. Without admit card candidates are not valid for giving the examination. Speed and time management is important in the examination. Good and effective study material is important for securing agood rank in the examination. Candidates should improve their basic concepts. Solving of previous question paper will help the candidates a lot and gives them a brief idea about the examination. Before filling the application form and submitting the enclosures candidates should recheck their information. Only black or blue ball-point pen is to be used during the examination on the OMR sheet. No pencil must be used to darken the circles on the OMR sheet. Candidates can buy or download previous year’s mock test papers of different programmes for BCECE. During the examination, it is recommended to candidates to carry an identity proof. Till the whole admission is over, candidates should preserve the admit card and present it during examination and counselling sessions. The result is based on by calculating the candidate’s performance in both the stages of the examination. The answer key will be available after the examination.